James also was a co-writer and did backing vocals for P.Y.T. on Thriller and was a featured vocalist on We Are The World. Yeah, they still show it every day. So it's been on 18 years at least. I think Mr. Bean had better ratings, though. OK cool, thanks. Mr Bean's still hilarious I think. Reminds me of like Chaplin or Buster Keaton. 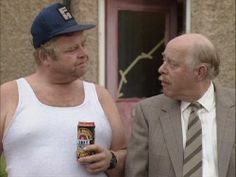 Richard and Onslow, both gone! "You see, you can't even see it. That lorry over there! "It's parked, on the other side of the dual carriageway!!!!!!!" "I don't think I like your tone, Richard." Yes, I was a fan. Rowan Atkinson is very talented. The other shows they currently show: Waiting For God, Last of the Summer Wine, One Foot in the Grave, As Time Goes By, Are You Being Served, The Vicar of Dibley, Open All Hours, Fawlty Towers, and To The Manor Born. The newer classic shows like Father Ted go to BBC America (they air Channel 4 shows which is kind of weird.) PBS only takes the newer UK dramas and Great British Bake Off. I didn't like Keeping Up Appearances but he was good in it. RIP. OK cool, thats interesting thanks. As I think I've mentioned before, we get PBSAmerica here on freeview/satellite/cable.